You can use the INDEX function to search for a text or phrase from a character variable. 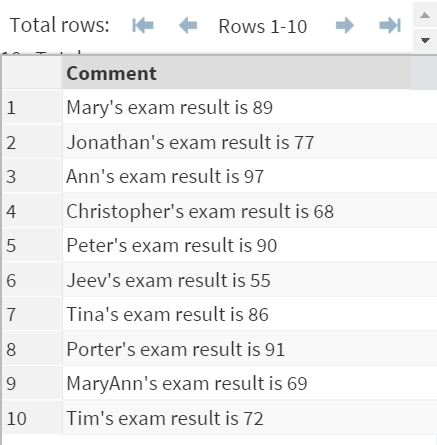 The EXAMPLE data set above contains a sentence. Now, we're going to use the INDEX function to search for the word "SAS" from the sentence. In this example, the INDEX function looks for the word "SAS" from the Text variable. The function found it at the 11th position, and thus, returns the numeric value of 11. If the word is not found from the variable, the INDEX function will return the value of 0. The case IS sensitive when using the INDEX function. Searching for the word "sas" is different than searching for the word "SAS". The INDEX function returns the value of 0 because "sas", in lower case, is not found from the Text variable. Only the exam result (numeric value) should be extracted.